The 2019 incentives will be announced soon! This year we have exciting incentives at different fundraising levels*. We hope these awesome gifts will help you achieve your goals and encourage you to aim high. All incentives will be given out on-site at Tour de Pink. If you raise $1,800 by July 1 you will receive a custom Long Sleeve T-shirt! Raise $3,000 to receive a Tour de Pink Sweat Resistant Towel. Raise $3,750 to receive Tour de Pink arm warmers. 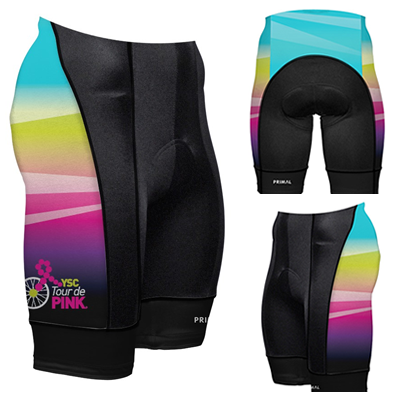 Raise $5,000 to receive a pair of Tour de Pink bike shorts. Raise $7,000 to receive an Tile sport and TdP Pouch (details below). Ready for anything: Waterproof and durable, Tile Sport stands up to the elements. Ring it, find it: Tile Sport has a 200 ft. range -that’s 2X our current Tiles. Plus, it’s even louder than ever, making it easy to find when it’s nearby. Find your phone: Double tap the button on your Tile Sport and your phone will begin to ring -even on silent, See it on a map. Raise $10,000 to receive a Wireless Enyo Headphone (details below). The Enyo Bluetooth headphones are fully loaded with deep bass, high vocal clarity, and a big soundstage so you can feel the power of your music. The Enyo Bluetooth headphones allows you to stream music from your Bluetooth enabled device giving you the freedom of wireless music without compromise. The built-in mic allows you to easily switch between music and calls. With up to 10 hours of playback time the Enyo headphones includes a built-in microphone, 3.5mm audio input and adjustable headband. The headphones fold inwards for portability and easily fit into the included carrying pouch. These headphones will work within 10 meters of your device providing the freedom of wireless mobility. Ride in two 2018 Tour de Pink rides to receive a custom photo print, suitable for hanging. Ride in three 2018 Tour de Pink rides to receive a custom photo book. *Designs and models are subject to change. Riders that raise $5,000 will receive one pair of bike shorts (mens or womens).